Today, I want to show you how to make a simple header for your MailChimp newsletter campaign. MailChimp is a free tool with paid options that small business owners can use to communicate with their audience. One of the best marketing tools for business owners is email marketing. It can be overwhelming when starting out. We are going to use (a free tool) PicMonkey to design the header of your MailChimp newsletter. “Designing” can be stressful if you’re not Photoshop savvy, but no worries, you don’t need to be proficient in design to build this banner. Your banner is the first thing users see when they open your campaign. 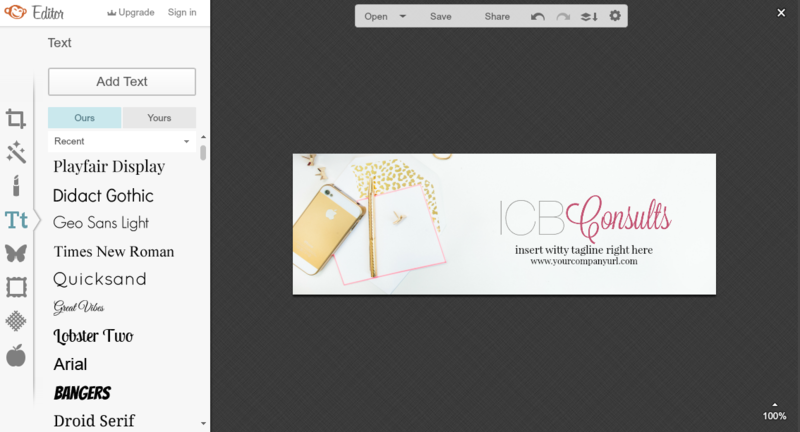 The sizing of your banner matters, in this case, your banner should be 600 x 200. Don’t over think this process of what it should be. If you have banners currently being used on social media, using the same images would be a great option, too. After you have either uploaded the styled stock photograph or your own image, it’s important to place your logo on the header image. When uploading your image please make sure you have a watermark of your logo. This is imperative so that the logo does not cover up the image in the background with white space. In addition to adding your logo, you can add your company’s tagline and URL right under the logo; if it’s not included in your logo watermark already. After you are done designing your header in PicMonkey, save it to a folder on your computer. I actually save all of my graphics for my newsletter in one folder to make it easily accessible. Log into your MailChimp account. You have two options: create a template or campaign. Personally, I suggest creating a template that you can continuously use for your business. Name your header and save your template after the design is complete. Now your audience has a beautiful header to greet them when they open your newsletter.